Cleaning the curtains is an oft-ignored chore when it comes to spring cleaning, partly because it’s easy to forget about them since they’re relatively out of the way, and partly because most people assume it will be a cumbersome and frustrating task! That said, it’s very important to keep your curtains clean since over time, they absorb all sorts of smells in your home, which can lead to foul odors and discoloration. Fortunately, cleaning your curtains doesn’t have to be a labor-intensive task. In fact, once you know how, we bet you’ll be shocked at how easy it is! A lot of people don’t realize this, but most curtains can actually be washed in an ordinary laundry machine, the same way you clean your clothes. This is especially true for heavier curtains. In order to keep colors and patterns intact, be sure to use cold water and the delicates cycle. Whatever you do, don’t be tempted to toss your wet curtains into the dryer after they’re cleaned as this can permanently misshape and damage them. Your best bet is hanging them outside (away from the sun to prevent discoloration). If your curtains are 100% cotton or have details like fringes or intricate embroidery, you’ll want to stick with hand washing. Since curtains take up quite a bit of space, the bathtub is a much easier place to do this than the sink. Be sure to use a gentle laundry soap, or even better a detergent that’s specially designed for curtains. Steam cleaning is an ideal option if you’re working with a very heavy material, or simply don’t want to take down and put back up the curtains. Just start from the top and work your way down, holding the curtains as straight as possible. If you notice the fabric becoming damp, hold the steam cleaner a bit further back. 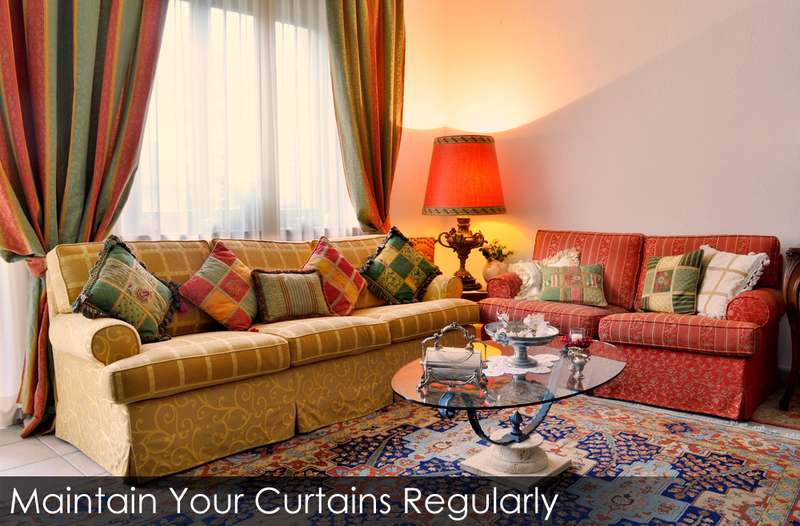 Maintaining your curtains regularly will make them much easier to clean when the time comes. Rather than letting dust collect for months and months, add the curtains to your weekly vacuuming routine. Another great trick, is letting them air out in the breeze every couple of months. This will eliminate a lot of the odors they may have absorbed. Lastly, prevent the absorption of odors in the first time by taking precautions like shutting kitchen doors when cooking, and never smoking indoors.